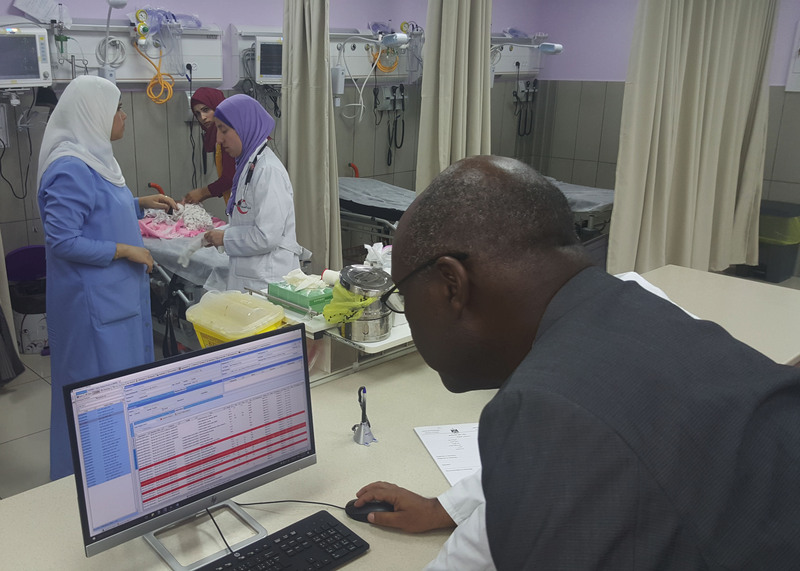 I get a demonstration of the health information system during a visit with health workers in the Pediatric Emergency Department at the Palestinian Medical Complex. Photo by Jihad Mashal for IntraHealth International. Outside the Palestinian Medical Complex in Ramallah, I saw a woman emerge from the crowd. She looked frantic with worry and purpose as she approached. She needed the doctor who was accompanying me, or rather his signature on a referral form—a formality that stood between her and the specialized health care she, or perhaps a loved one, needed. I was there last month to visit our Palestinian Health Capacity Project, which is doing crucial and challenging work to help the Palestinian Ministry of Health rationalize its patient referral system, improve continuing professional development for its health workforce, and strengthen its health information system. This woman was the perfect illustration of the purpose of our project. My colleague stopped to review and sign the form, and told me it happens all the time. It is not easy for Palestinians to access the health care they need. Lives depend on forms like the one that woman was carrying. Primary care is available in the West Bank and Gaza, but quality is an issue. Clinicians deal with extraordinary caseloads and do not have systematic opportunities to routinely update their skills and knowledge. Underlying these problems is a severe shortage of health workers. I visited a beautiful, new, 10-bed pediatric ward at the Palestinian Medical Complex. Only two beds were functional. There weren’t enough human resources to run the ward even close to its capacity. In fact, the public health system is not equipped with the staff or facilities to provide most tertiary (or specialized) care. If you need such care—like dialysis or treatment for cancer—you must get a referral to a private hospital in the West Bank, East Jerusalem, or abroad. Referring so many of its clients to hospitals outside of its own system is not ideal for the ministry. But at this point in time, it’s necessary—and very costly. In 2014, referrals to Israeli hospitals cost the Palestinian authority a mindboggling $100 million. IntraHealth International has been working with the ministry of health since then to standardize the system and bring down costs. There are now agreed-upon prices for services with referral hospitals and processes in place to ensure each referral is medically necessary. In 2015 and 2016, the costs dropped by 30% compared to 2014. While I was visiting, the ministry launched an eReferral system to further streamline the mostly paper-based process and opened the first of several planned customer service centers where health care clients can ask questions or get information, rather than having to track down their doctors on the hospital steps. We’ve also helped the ministry develop a national strategy for continuing professional development and to strengthen its health information system, which will provide powerful data to inform decisions. When I spoke with health workers and officials in West Bank, most of them said our contributions are helping them get organized—helping establish processes and collect data to increase efficiency, reduce costs, and provide information the health sector can use to improve care. They are right. This is part of what we call systems strengthening. As I prepared for my trip, someone asked me why IntraHealth is engaged in strengthening a health system that is operating in chronic distress. After all, everything is patchwork. How can a thriving health system ever exist when there is no end in sight to the occupation and the threat of violence is part of everyday life? Isn’t it a losing battle? Palestinians don’t just need health care someday down the road. They need it today. Of course this type of work is not business as usual, and the immediate goal cannot be a state-of-the-art, high-functioning health system that offers every level of impeccable care. But because there is a semifunctioning system in place, we can help the ministry lay stronger groundwork for when things improve, and at the same time make the health system more efficient and resilient right now. Simply put, we can help the government provide the best possible care to its people, even in these difficult circumstances. To do that, the typical linear approach—assessing and updating policies, developing and rolling out standards and protocols, and so on—won’t work. Instead, we must be prepared to deal with emergencies as they come (and they will come) while also establishing improvements that can survive the emergencies. At the same time, saving money—such as through referral reform—puts the ministry in a much better position to continue improving systems for better health care. And by addressing critical issues of access and quality, the ministry can help the Palestinian population achieve better health and better lives. Good health is just the first step. West Bank is ready for multisector approaches. Despite the ongoing conflict, Palestinians are seeing new economic opportunities, particularly in the technology sector. Health and economic development can come together and improve not only health, but also engagement in civil society, governance, and the economy. We simply cannot and should not wait for the conflict to end before strengthening these health systems. Palestinians don’t just need health care someday down the road. They need it today. This post originally appeared in HuffPost. The Palestinian Health Capacity Project is funded by the US Agency for International Development.